This little gem was painted in the downtown of the next town over from my house. There is not much of a commercial district there, but a couple of nice restaurants and galleries that are really worth a visit. This work is unframed, but it is mounted on a board with a slot in the back which allows you to display it without a frame. This entry was posted in Available, Painting A Day and tagged daily paintings, Landscape Paintings, Maine Paintings, oil paintings, Plein Air Paintings, RockportME, Stephan Giannini on November 11, 2016 by Stephan Giannini. 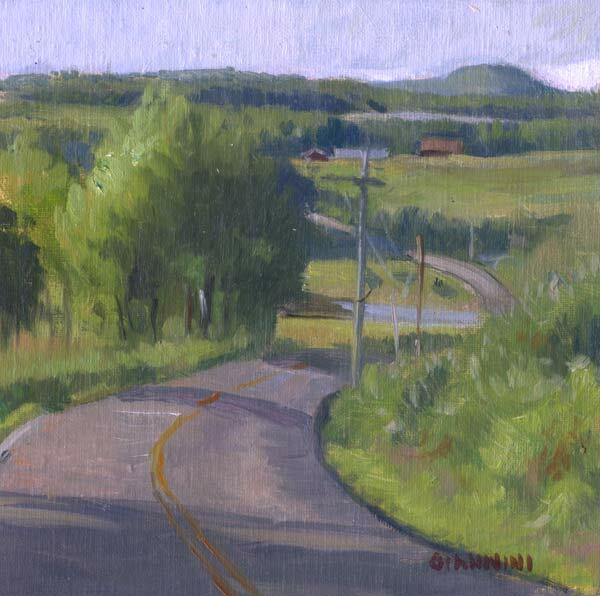 This painting was painted in Woodstock, Vermont while I was participating in a Plein air event for the Vermont Institute of Science. This beautiful Billings Farm is a working dairy farm in the traditional manner and open to the public for an entrance fee. It is across from and related to the Marsh-Billings-Rockefeller National Historical Park . If you would like to bid on this painting on E- bay starting at $90, click here. 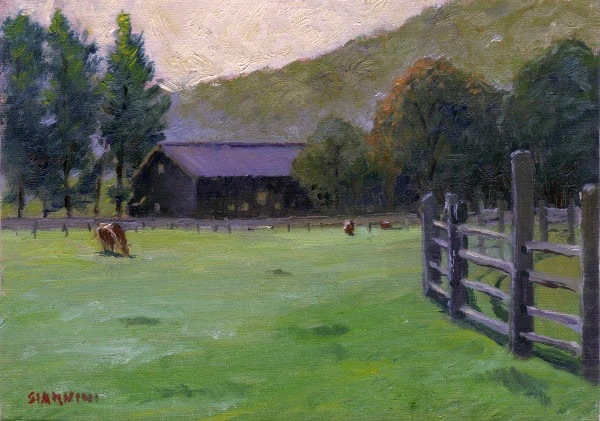 This entry was posted in Available, Painting A Day and tagged Billings Farm, Landscape Paintings, Oilpaintings, Plein Air Paintings, Stephan Giannini, Vermont, WoodstockVT. on November 4, 2016 by Stephan Giannini. I painted this fun Pumpkin study at a farm that runs a little roadside stand about 20 mins. from my house. 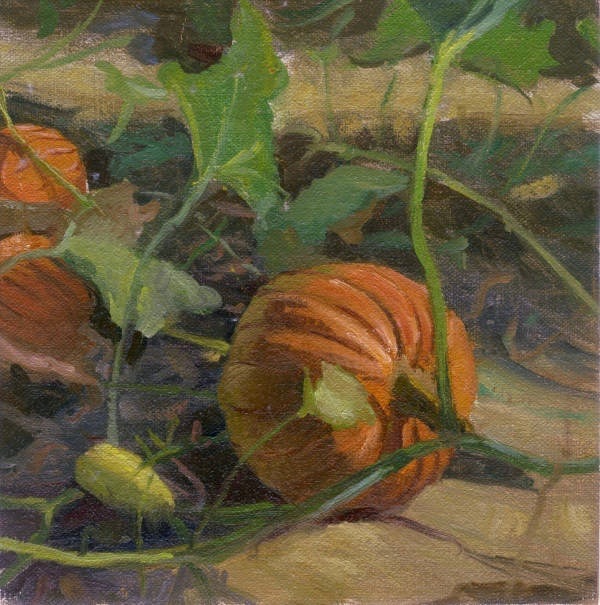 Pumpkin Patch, 6 x 6 in., oil on linen on board. This entry was posted in Available, Painting A Day on October 7, 2016 by Stephan Giannini. Here is a new work done especially as a small auction piece. If you would like to bid on this painting on E- bay starting at $90, click here. Eeny, meeny, miny, moe, Catch a tiger by the toe, If he hollers, let him go, Eeny, meeny, miny, moe. Not because you’re dirty, Not because you’re clean, just because you kissed a boy behind a dirty magazine. This entry was posted in Available, Painting A Day on September 22, 2016 by Stephan Giannini. This is the tugboat from the cement factory wharf located a few miles out of town. Rockland has a long history of working with, well, rocks! Granite, lime and cement have been produced here for year. This entry was posted in Painting A Day on December 18, 2015 by Stephan Giannini. 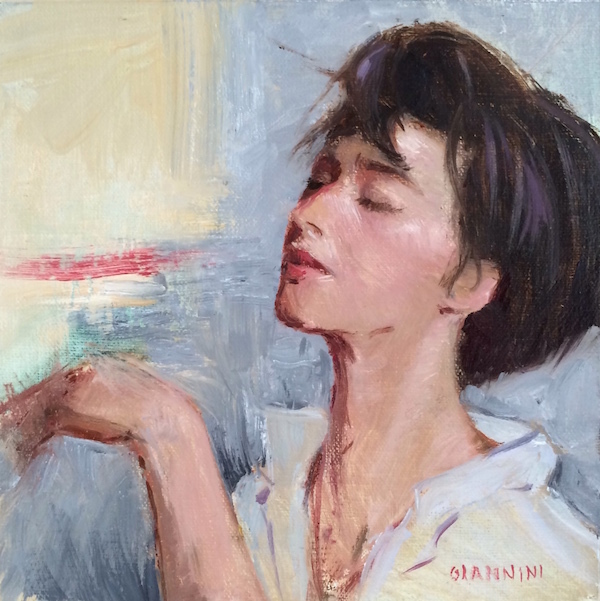 A Day Off, 6 x 6 in., oil on linen on board. This sketch was done at the commercial docks on the other side of town from my waterfront area. This entry was posted in Painting A Day on December 11, 2015 by Stephan Giannini. Here is an August moon-rise in the marina just steps from my house. This entry was posted in Painting A Day on December 4, 2015 by Stephan Giannini. I did this painting standing on the public dock in Tenants Harbor, a small town down the road from my home. Jamie Wyeth lives on an island viewable from the dock. This entry was posted in Painting A Day on November 27, 2015 by Stephan Giannini. Near Acadia, Schoodic Point, Maine, 6 x 6 in. I did this painting while on a a painting excursion with Peter Yesis and Steve Hileman up to the Schoodic point region of Acadia National Park. It’s a terrific place to paint and they recently opened up a new campground, which I ‘d like to give try next year. 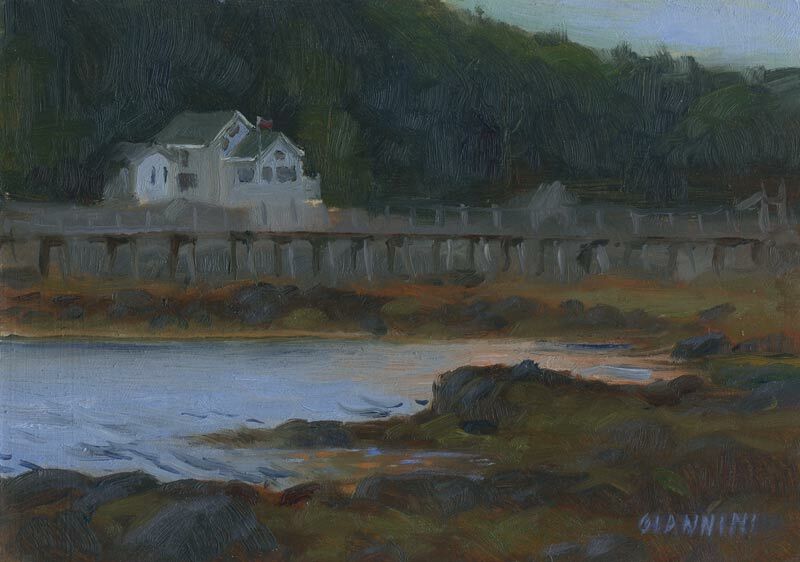 This entry was posted in Painting A Day and tagged Acadia National Park, Landscape Paintings, Maine, Maine Paintings, oil paintings, Plein Air Paintings, Schoodic Point on November 23, 2015 by Stephan Giannini. This is a long view of a local farm that sells direct to the public and have a wonderful little farm-stand. I believe that is Mount Battie in the background, which overlooks Camden, Maine. This entry was posted in Painting A Day on October 8, 2015 by Stephan Giannini. 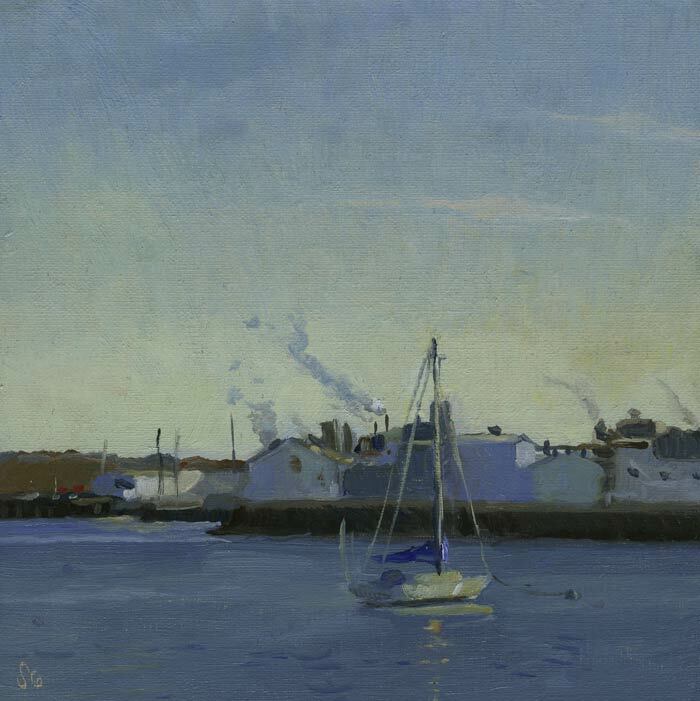 Knights Marine, Rockland, Maine, 6 x 6 in. This boat was dry-docked just a few hundred feet from my house at the local marina. The late sun created a dramatic scene. This entry was posted in Painting A Day on September 17, 2015 by Stephan Giannini. 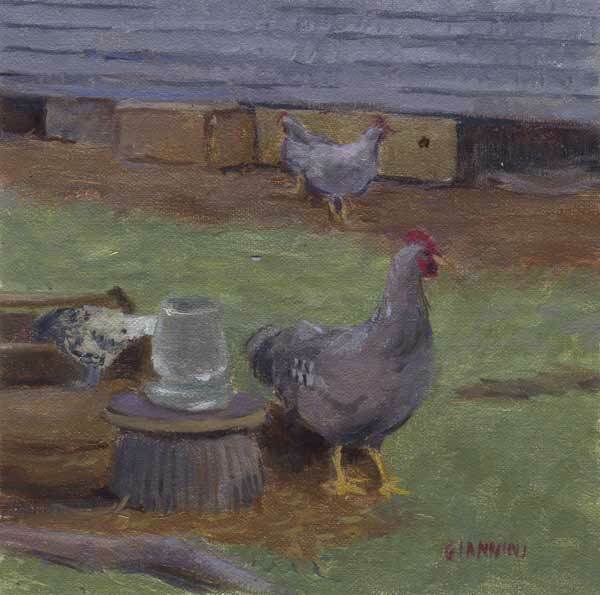 Chickens, Port Clyde Maine, 6 x 6 in. I did this fun little study of Chickens from life at a farm in Port Clyde, M Maine. This was painted during a fun outing with a group of painters staying nearby at the Nanatuck House. The farmer raises these chickens as show birds and they were a beautiful group. It was great fun to paint with the group, too! 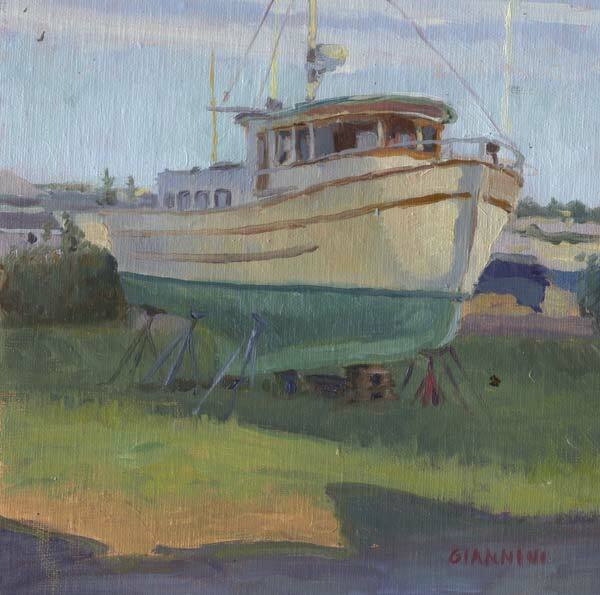 This entry was posted in Painting A Day and tagged Maine Paintings on September 10, 2015 by Stephan Giannini. Weskeag Store, Maine, 6 x 6 in. It has been a long time since I posted. I’ve been busy on my house, and just started painting again this summer. I know you have all been impatiently waiting:)! This is the view down towards the St. Georges river in South Thomaston, Maine, just a short distance from my house. It’s a great place to paint and the store is handy for a cold drink or sandwich. This entry was posted in Painting A Day on September 3, 2015 by Stephan Giannini. Merry Christmas! Hope you enjoy yourself wherever you are today! I’ve had this pump sprayer for years. It’s designed to spray fixative or varnish on paintings in a “green” fashion. No atmosphere harming propellants produced! 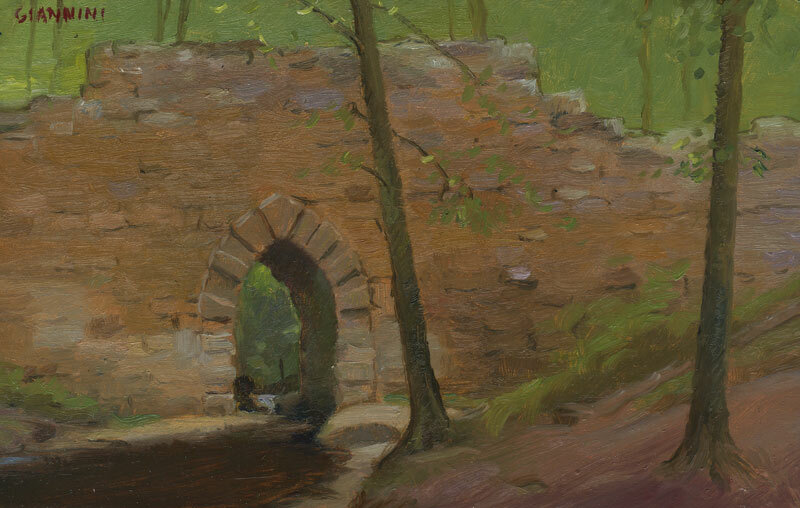 The “Alizarin” in the tile refers to a specific color, Alizarin Red. This entry was posted in Painting A Day on December 25, 2014 by Stephan Giannini. Fog in East Boothbay, Maine, 5 x 7 in. This was painted during The Plein Air Painters of Maine annual Oil Painters of America national paint-out this summer. It was sunny in the morning, but then some fog rolled in. 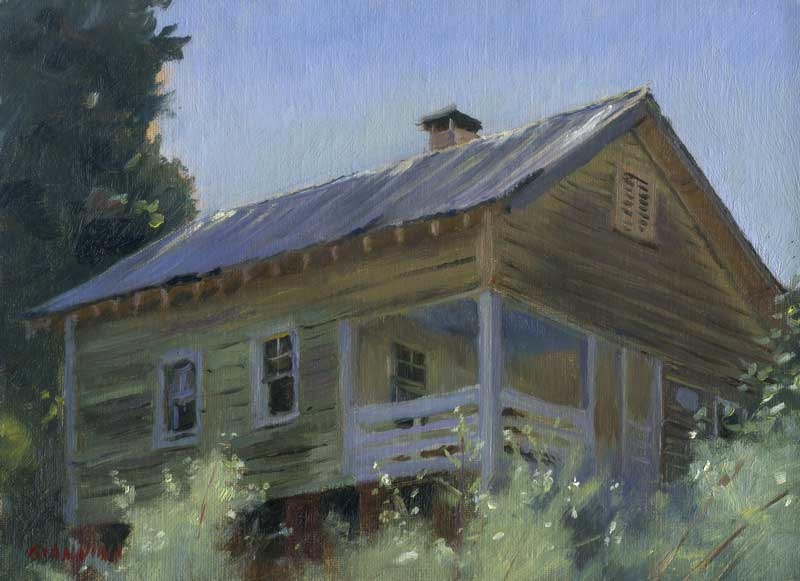 About 45 artists showed up including a few from the Plein Air Painters of the Southeast, who were renting a house locally. I ran into a painter from my dad’s town in North Carolina, Rich Nelson, a fine portraitist and oil painter from North Carolina. He invited me to do some work for his gallery for the Tryon International Equestrian Center, which I will work on early next year. 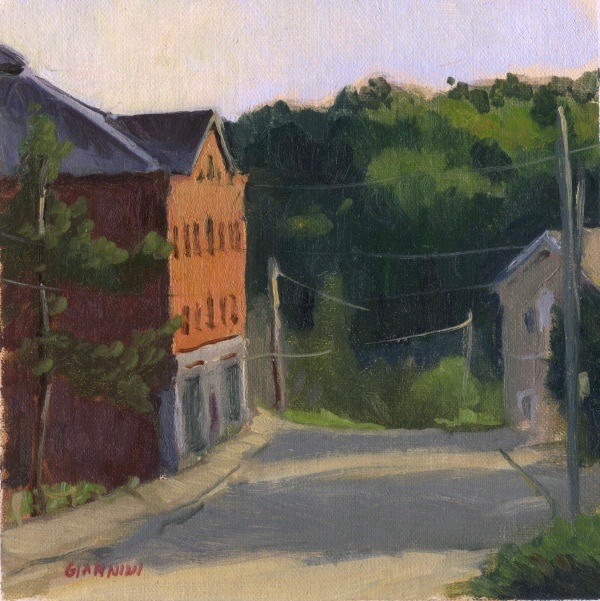 This entry was posted in Painting A Day and tagged Landscape Paintings, Maine Paintings, oil paintings, Plein Air Paintings, Stephan Giannini on December 18, 2014 by Stephan Giannini. Fall In Maine, 5 x 7 in. As usual, the fall colors up in Maine were spectacular. I was so busy, I think this was the only study I did this year. I live on the coast, but the land slowly rises to some low hills just a mile or two inland behind my house, which is where I did this. This entry was posted in Painting A Day on December 10, 2014 by Stephan Giannini. 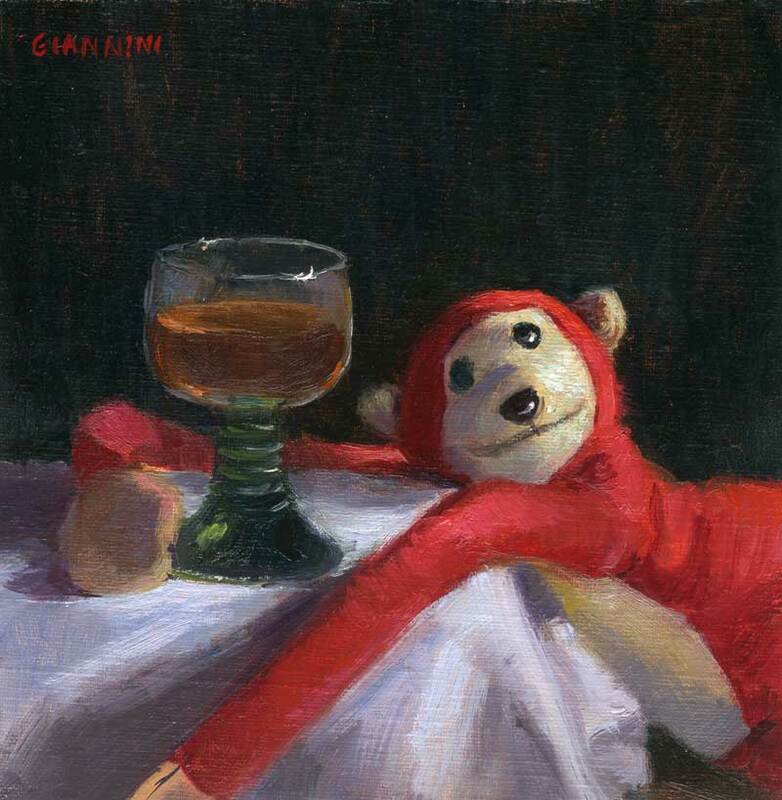 Drunk Monkey with a Manhattan, 6 x 6 in. He’s Back! And it’s that time of year again. Up here in the long winters of Maine, it’s hard not to seek warmth and distraction by imbibing a little. Of course my monkeys problem is that he’s so teeny. A couple sips and he’s dancing around the room, a couple more and he’s slurring, and a couple more after that, well, that’s all she wrote. And apparently he likes his Manhattans’ with an orange, which is just wrong! This entry was posted in Painting A Day on December 8, 2014 by Stephan Giannini. Little Deer Isle, Maine, 6 x 6 in. I needed a cook stove. And I found an incredible deal, except it was about a two hour drive away from my house on Maine’s Blue Hill Peninsula. But it is such a beautiful place to paint, that I figured I could get a sketch out of the deal, too. And I was right! 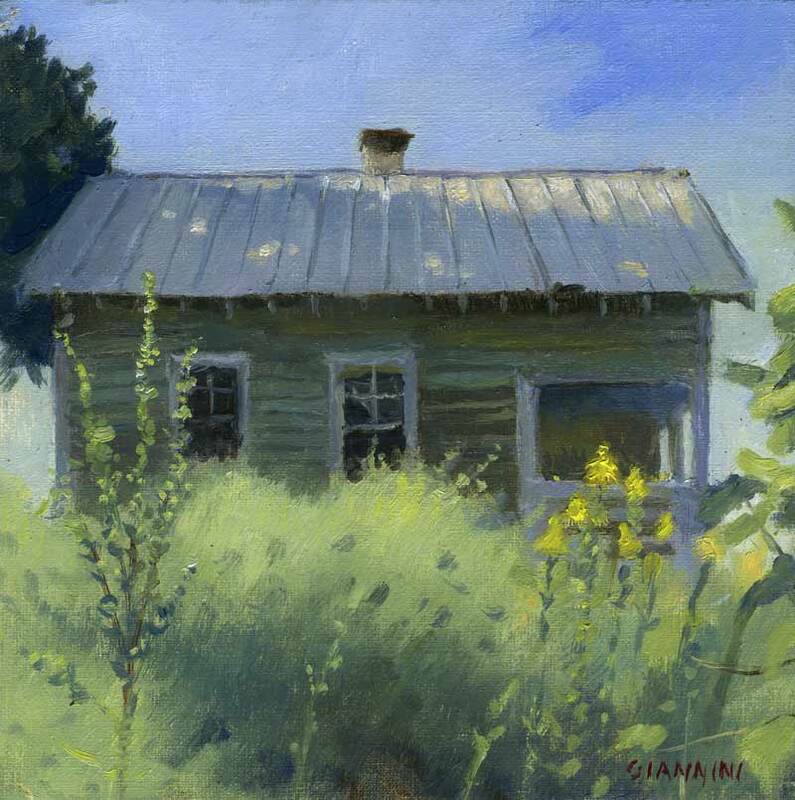 This entry was posted in Painting A Day and tagged Landscape, Maine Paintings, oil paintings, Plein Air Paintings on December 6, 2014 by Stephan Giannini. Chinese Lanterns and Silver, 5 x 7 in. I rescued these Chinese lantern pods from a yard refuse pile just around the corner from my house. I had knocked several times on the owners door seeking permission to pick some from their garden, but never caught them at home. But once a few were in the refuse pile, I just snatched them and hung them to dry for a few days. This entry was posted in Painting A Day on December 1, 2014 by Stephan Giannini. 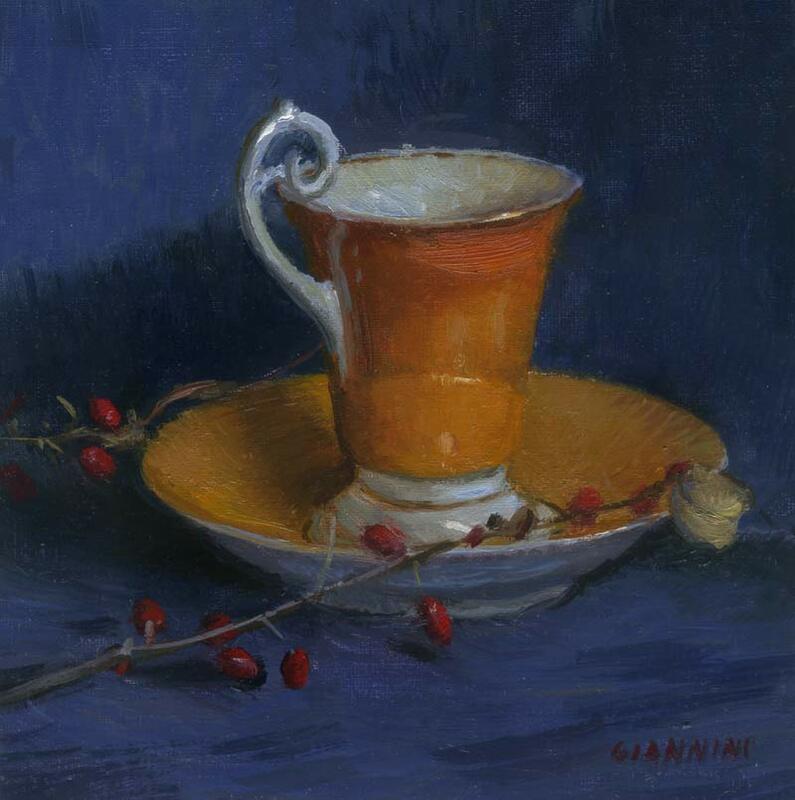 My Orange Cup, 6 x 6 in. This beautiful little cup was given to me by my Mother, many years ago. 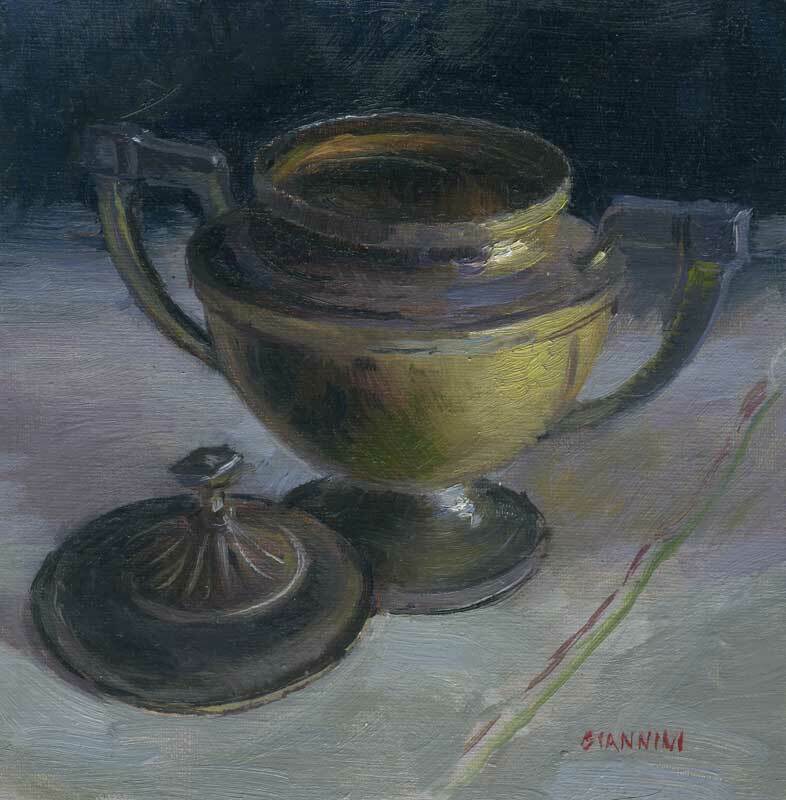 It’s had a starring role in several still life paintings I have painted over the years. The berries were scrounged (surreptitiously) from one of my neighbors bushes! This entry was posted in Painting A Day and tagged blue, oil paintings, orange, Stephan Giannini, still life on November 27, 2014 by Stephan Giannini. Rockland Maine Breakwater Light, 6 x 6 in. This is the Rockland Harbor Breakwater, which is a 4,300-foot (1,300 m) breakwater which protects Rockland Harbor, and was completed in 1902. Just at the end you can see the old lighthouse. I was sitting down near the beginning, enjoying the piles of old granite. It’s a lovely walk out there to the end on a warm summer day, and is often a busy tourist attraction. This entry was posted in Painting A Day on November 22, 2014 by Stephan Giannini. Here is a small painting I did near home, at the town dock just a mile from my house. This boat, called “Sweet Chariot” is based on the island of Vinalhaven, about 12 miles offshore from my house. The Captain said it was originally from the west coast, and had been built for former Japanese-American internees after WW2, to provide them with work . Interesting that it had made its way all the way to Maine! Available for $100, which includes shipping. This entry was posted in Painting A Day on November 4, 2014 by Stephan Giannini. 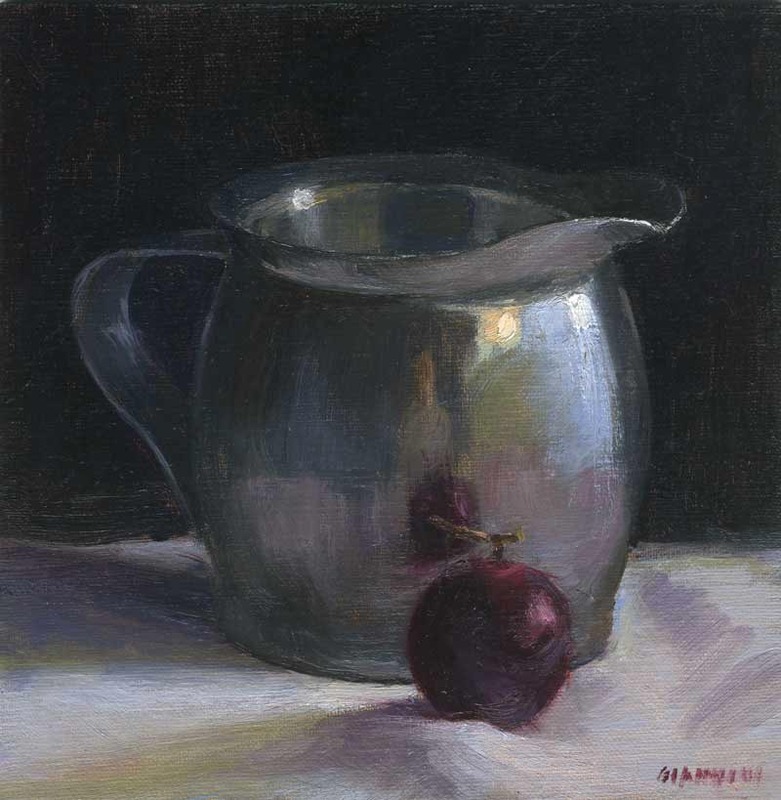 Ohio Shadows, oil, 6 x 6 in. Currently at auction.Click here to take a look. 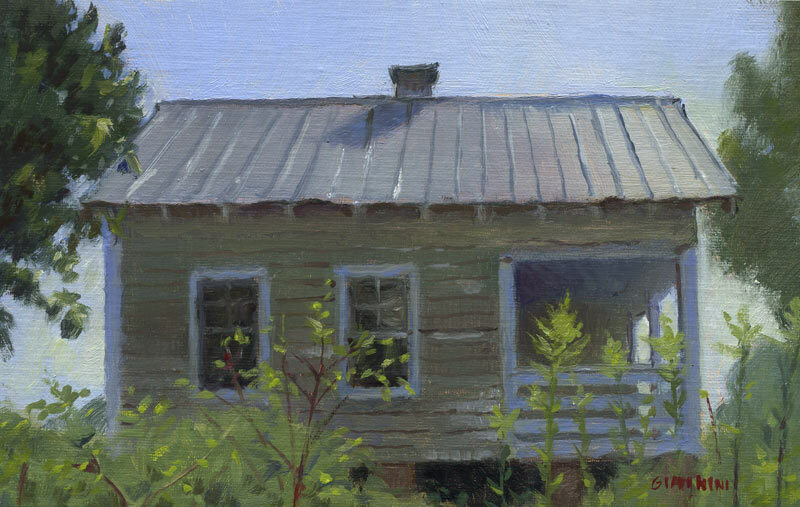 Here is a small study I did near Bowling Green, Ohio when I was out their earlier this year. The thin Shadows from a tree on the left added some excitement to the composition! This entry was posted in Painting A Day and tagged daily paintings, Landscape Paintings, Stephan Giannini on October 7, 2014 by Stephan Giannini. Moonrise Over Maine, 5 x 7 in. 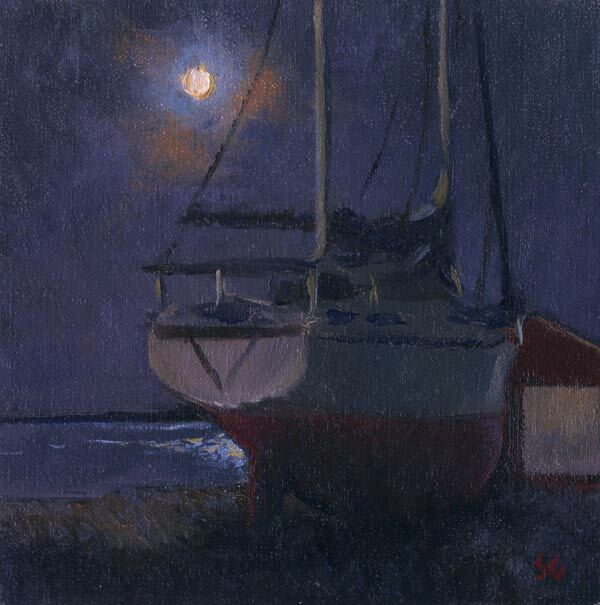 Here is a painting of a summer moon rising over the harbor in Rockland, Maine , just a few hundred feet from my house. I wasn’t expecting the moon, so I was quite pleased! Available for $100.00. Click here to purchase. This entry was posted in Painting A Day on September 3, 2014 by Stephan Giannini. Here is a painting I did near Bowling Green Ohio when I was working out there earlier this year. I saw this incredible looking barn on my way home from work one day when I was taking the scenic route. This entry was posted in Painting A Day on August 26, 2014 by Stephan Giannini. 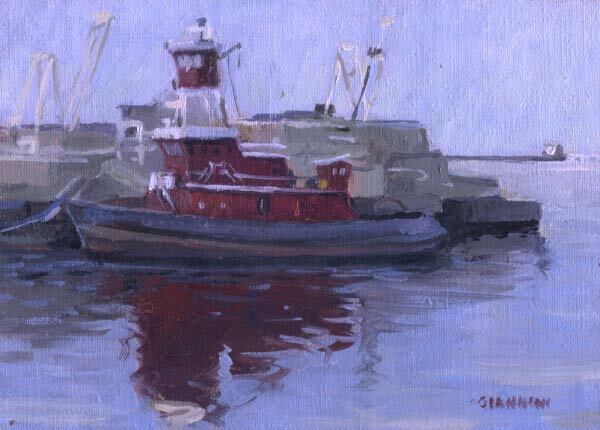 View of Stonington Harbor, 5 x 7 in. This painting is currently at auction. Click here to take a look. 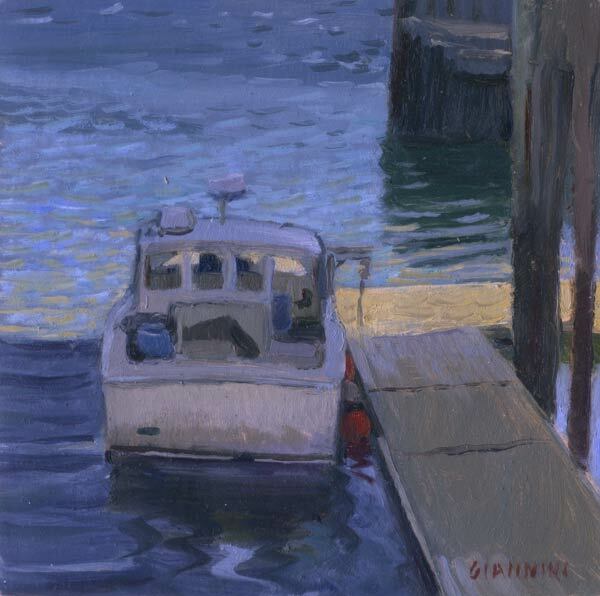 Here is a painting I did in Stonington, Maine on a recent visit there. After I finished some very fun people invited me over for dinner. Which was wonderful until I had to get in the car and at 10 PM and drive 3 hours home! This entry was posted in Painting A Day on August 22, 2014 by Stephan Giannini. 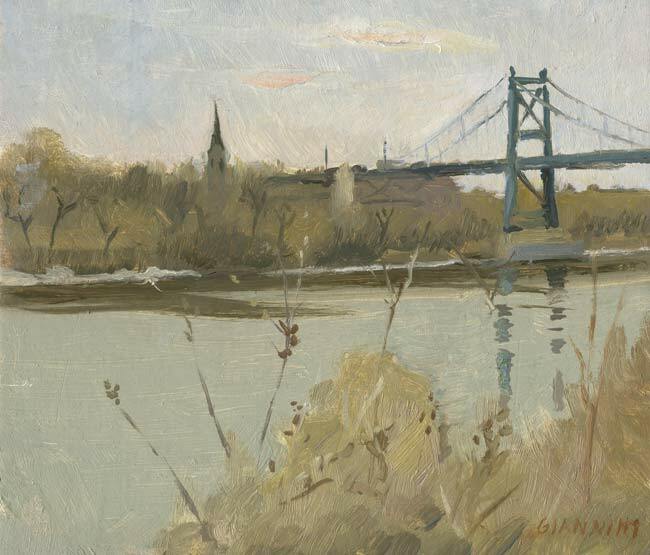 Blue Bridge, Toledo, Ohio, 6 x 7 in. Idid this painting of Toledo’s Maumee River with the blue bridge on the same cold winter afternoon that I did the “Toledo Granary” painting. I just turned around and started another sketch! I couldn’t ascertain the name of this bridge, not on google maps at least, but someone said they thought it was the East-Gate bridge. You can see some snow on the far shore. This entry was posted in Painting A Day and tagged Bridges, Cityscape, Landscape, Plein air, Toledo on May 1, 2014 by Stephan Giannini. 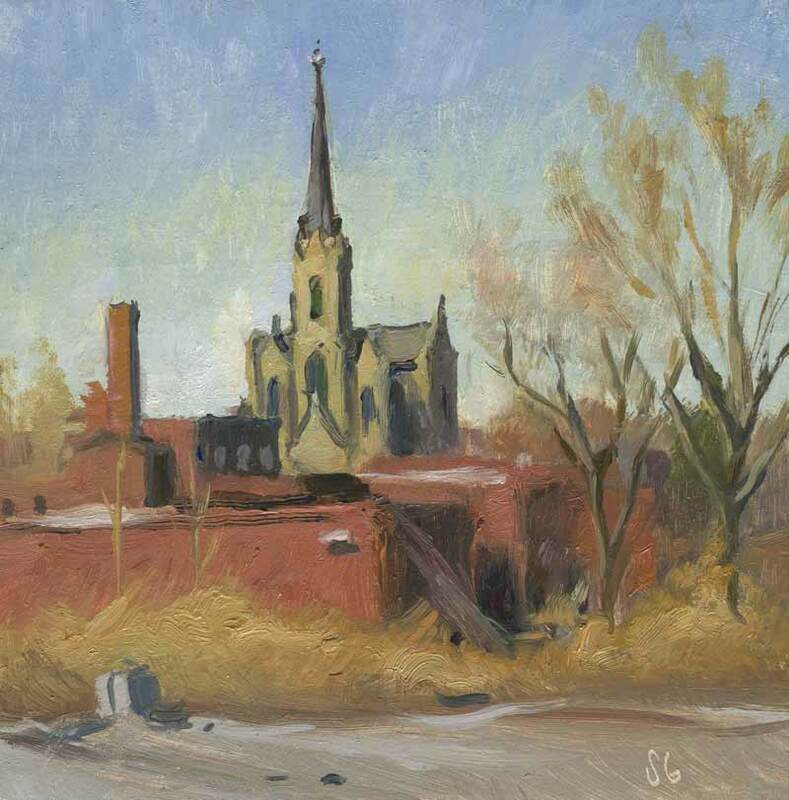 St Patrick’s Church, Toledo, 6 x 6 in. I did this painting of Toledo’s St. Patrick Church on a Sunday afternoon with a viewpoint in the local arts district. I believe the hill is called Links hill and the area was originally home to Irish Catholic immigrants. Father Edward Hannin was 36 years old when he was assigned to organize a parish in Toledo’s Irish Catholic population. It was a challenge, for in 1862 the city was busy constructing the Miami and Erie Canal and its laborers were more interested in saloons than churches. I’ve started using new panels with a hanging slot on the back, so this painting is ready to hang without a frame! This entry was posted in Painting A Day and tagged Cityscape on April 16, 2014 by Stephan Giannini. 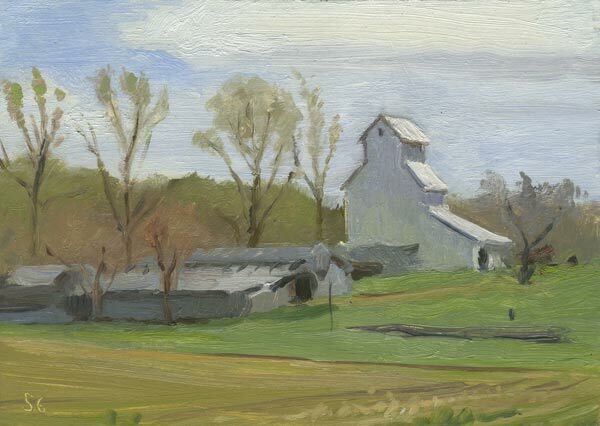 Toledo Granary, 7 x 7 in. 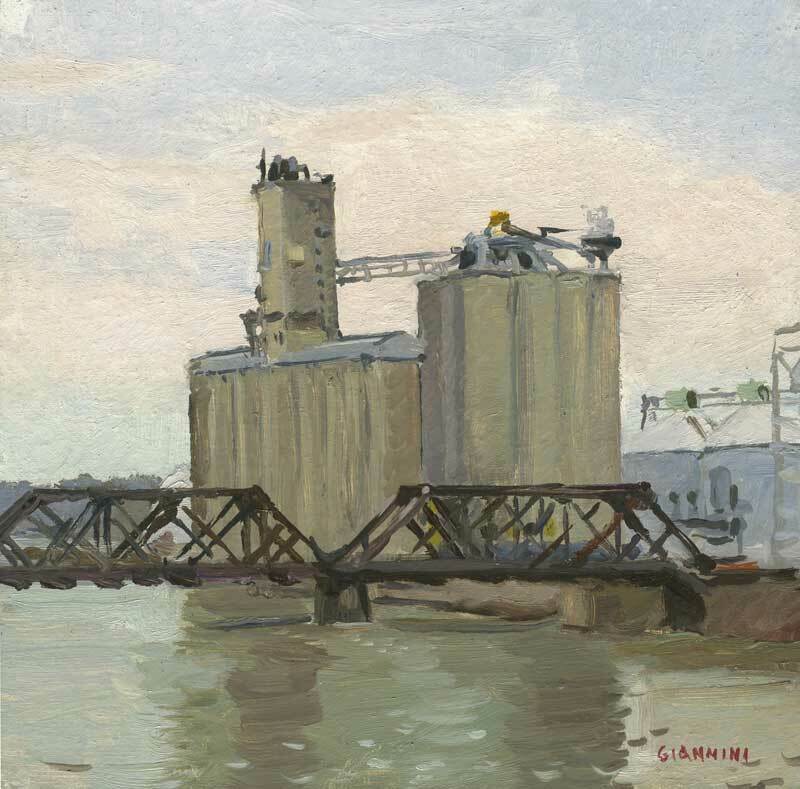 Here is a sketch of the ADM granary on the Maumee River in Toledo, Ohio. A cold, late winter afternoon. I definitely suffered for my art, or at least my numb hands did. This entry was posted in Painting A Day and tagged Cityscape on April 12, 2014 by Stephan Giannini. Here is my little red friend again. He was just seething with impatience for me to finish. Claimed his arms were tired. I told him that to make great art, there is always some suffering involved. This entry was posted in Painting A Day and tagged Cityscape on April 2, 2014 by Stephan Giannini. This entry was posted in Painting A Day and tagged Cityscape on March 24, 2014 by Stephan Giannini. “Near Boothbay Harbor, Maine” 5 x 7 in. Here is a view of a pretty cove near Boothbay Harbor in Maine. The last rays of the sun really set the water sparkling! Oil on acid free cardstock. $50 plus $6 shipping. This entry was posted in Painting A Day and tagged Cityscape on December 16, 2013 by Stephan Giannini. 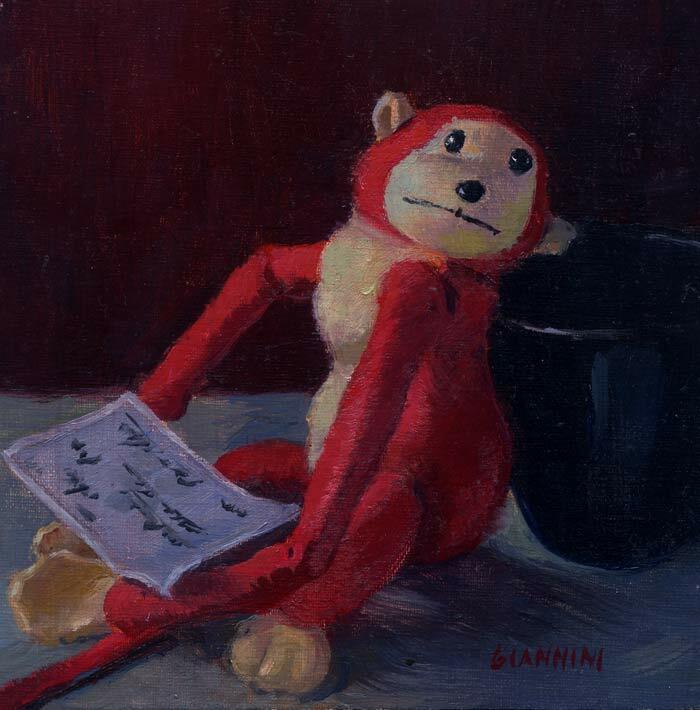 “Monkey With a Holiday Check”, 6 x 6 in. This entry was posted in Painting A Day and tagged Cityscape on December 14, 2013 by Stephan Giannini. 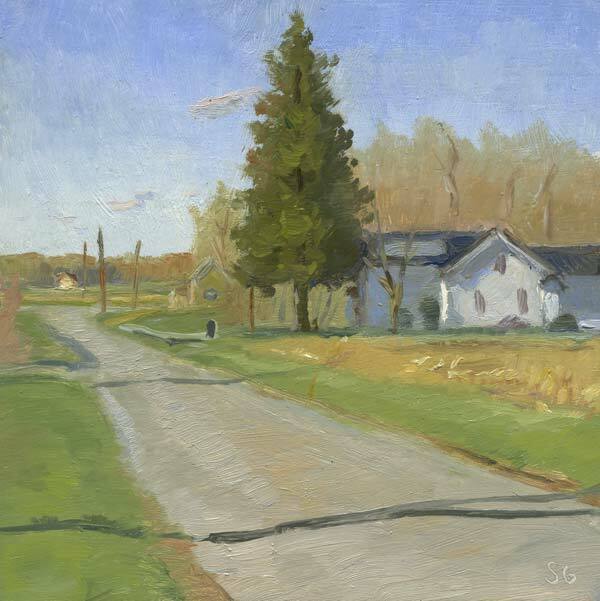 I did this painting outside of Lasalle, Illinois on a quiet farm road. It’s so flat in that part of the country, sometimes it’s seems you can see to infinity. This entry was posted in Painting A Day and tagged Cityscape on November 30, 2013 by Stephan Giannini. Burlesque Dancer at Rest, 6.5 x 10 in. 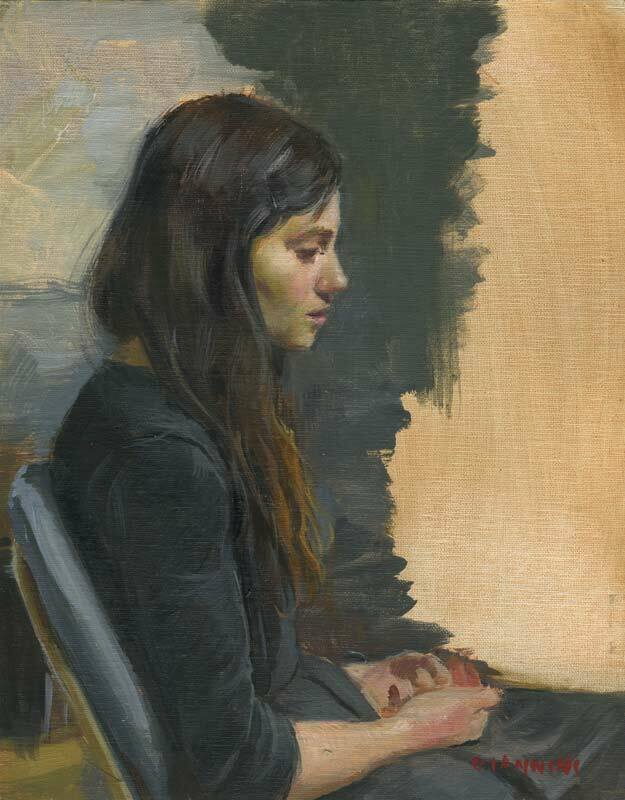 This is a painting from the model done at Chicago’s Palette and Chisel Academy of Fine Arts. She seemed like she was taking a break from a busy nightclub job….. This entry was posted in Painting A Day and tagged Cityscape on November 29, 2013 by Stephan Giannini. This entry was posted in Painting A Day and tagged Cityscape on November 28, 2013 by Stephan Giannini. 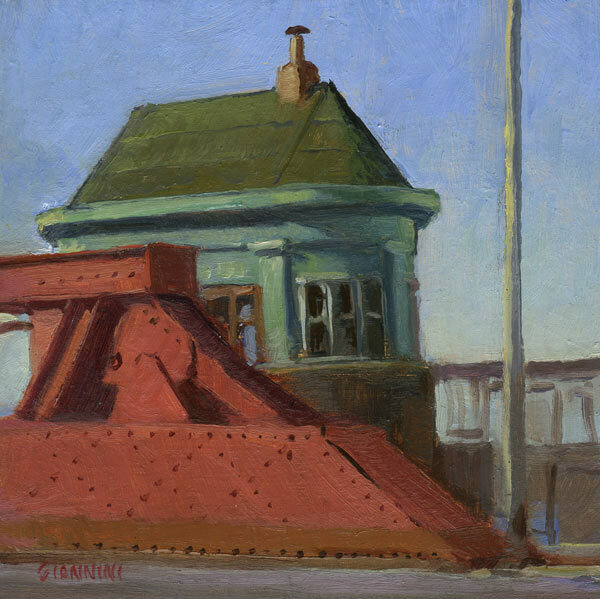 Chicago Ave Bridge, 6 x 6 in. 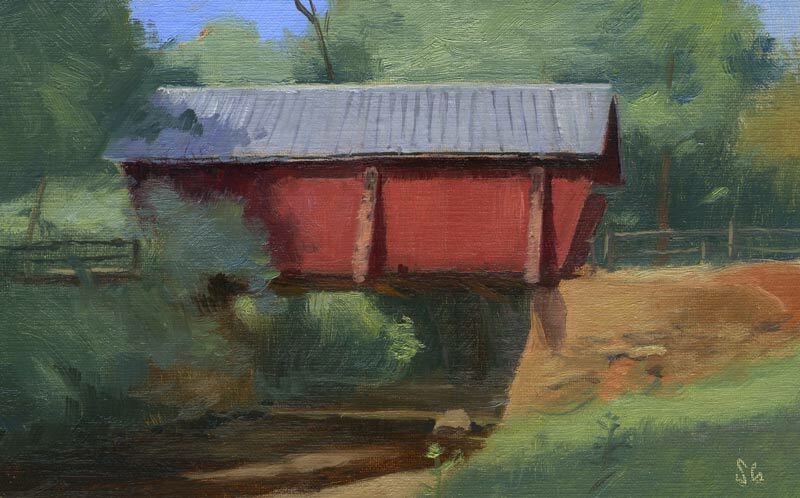 This is one of my favorite subjects in Chicago and I have painted this bridge- tenders house several times. This entry was posted in Painting A Day and tagged Cityscape on November 19, 2013 by Stephan Giannini. Study of Claire, 10 x 8 in. Here is a study of a beautiful model I did at Chicago’s Palette and Chisel club. This painting is priced slightly higher than usual because it is larger. This entry was posted in Painting A Day and tagged Cityscape on November 17, 2013 by Stephan Giannini. 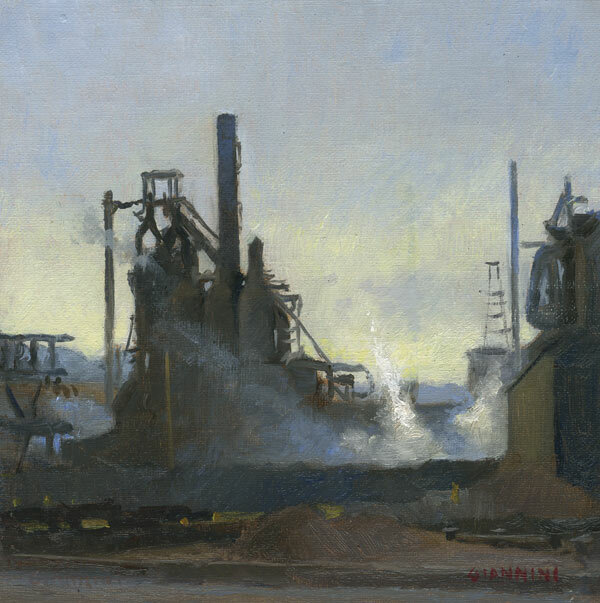 Pittsburgh Steel Mill, 6 x 6 in. This is the Mon Valley works Edgar Thompson plant just east of Pittsburgh in Braddock, Pa. Majestic, almost like a castle…. Braddock is a town that has seen hard times, but is offering houses dirt cheap to artists or other people looking to move there. This entry was posted in Painting A Day and tagged Cityscape on November 15, 2013 by Stephan Giannini. This entry was posted in Painting A Day on October 18, 2013 by Stephan Giannini. Jazz musician and civil rights activist Nina Simone grew up in Tryon, N.C., where she started her musical education. This is the old family home, an extremely modest wooden house that must have been quite the party with eight people living in it. It’s quite overgrown, but it’s actually for sale now and there is a nonprofit set up to raise funds for its restoration. This entry was posted in Painting A Day on October 16, 2013 by Stephan Giannini. 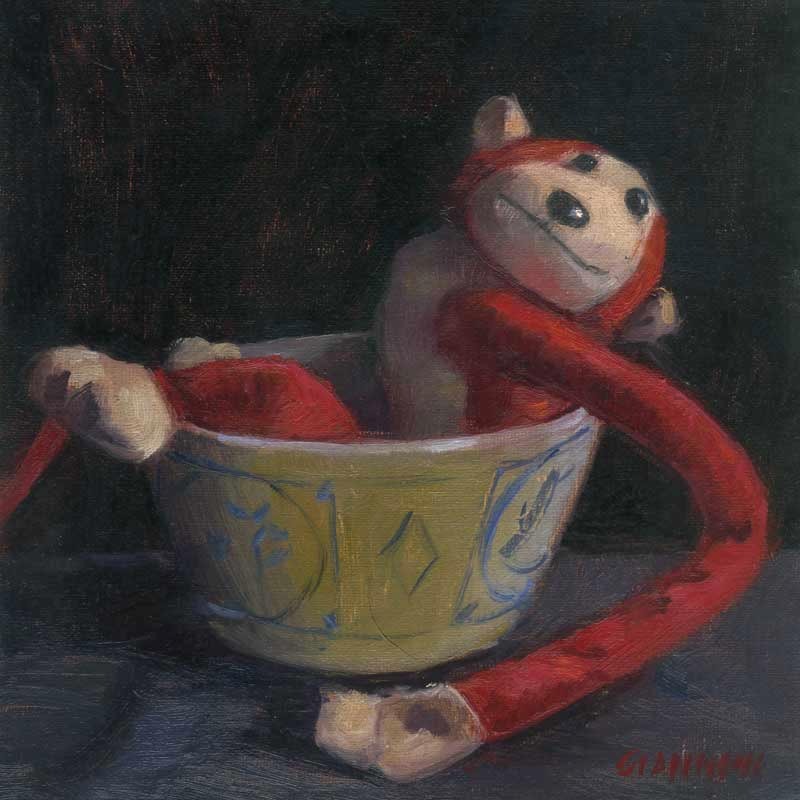 Monkey Soup, 6 x 6 in., oil on linen. This entry was posted in Painting A Day on October 14, 2013 by Stephan Giannini. 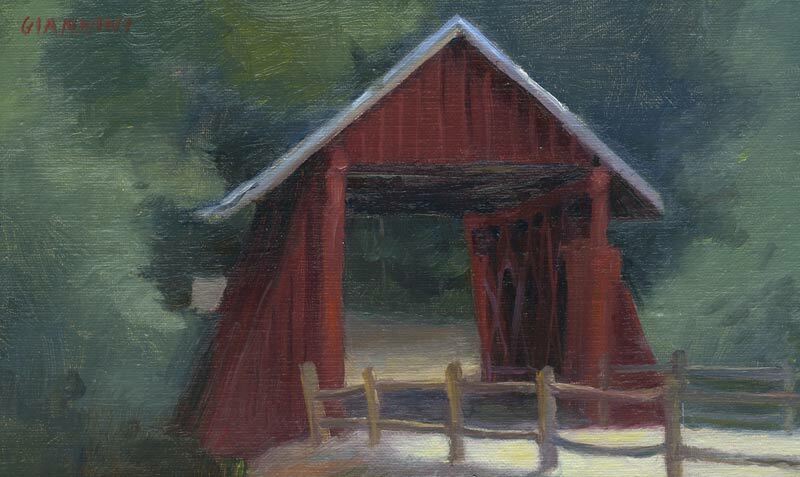 Here is a second version of a local covered bridge in the northeastern corner of South Carolina. A popular tourist attraction that was only closed to vehicles in 1984. This entry was posted in Painting A Day on September 27, 2013 by Stephan Giannini. Here is a local covered bridge in the northeastern corner of South Carolina. A popular local tourist attraction that was only closed to vehicles in 1984. This entry was posted in Painting A Day on September 25, 2013 by Stephan Giannini. Here is a very old bridge in the northeastern corner of South Carolina. It was actually built in 1820 and was a bridge on the road between Asheville, N.C. and Greenville, S.C. This entry was posted in Painting A Day on September 23, 2013 by Stephan Giannini. This entry was posted in Painting A Day on September 20, 2013 by Stephan Giannini. This entry was posted in Painting A Day on September 19, 2013 by Stephan Giannini. Morris The Horse #2, Tryon, N.C. 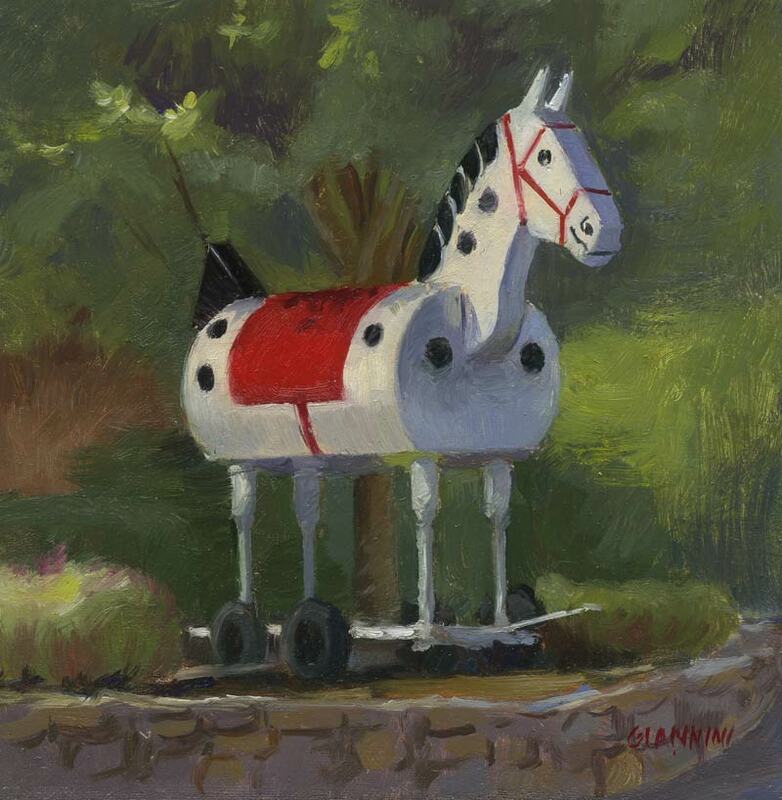 This is another painting of the town mascot of Tryon, N.C., the town I am visiting right now. It was a life-size version of a popular wooden toy that used to be produced by a local toy manufacturer. Read more about Morris here. This entry was posted in Painting A Day on September 17, 2013 by Stephan Giannini. My favorite stuffed monkey drunk again. He just can’t help himself. I’m trying to encourage counseling, but he insists it doesn’t harm his stuffing…. This entry was posted in Painting A Day on September 8, 2013 by Stephan Giannini. This entry was posted in Painting A Day on September 7, 2013 by Stephan Giannini. This is where I post small paintings that I auction on e-bay or sell at a fixed price here. I never actually post daily. Right now one of these small paintings starts at auction at $90. If it doesn't sell at auction, It'll be offered for $100 fixed price here. I also sell larger work online. If your interested in purchasing paintings take a look at my online shop here. If you don't see a specific painting you liked of mine in the shop, please inquire, I may just have not put it up. To see my regular portfolio website and blog click here. If you are interested in getting notices whenever I post new work, fill in your e-mail below and click subscribe. It's easy to unsubscribe and I will never share your email. Signup for my very occasional art and travel e-mail newsletter. Different than subscribing to my blog posts above.